This is part 2 of the 4-part patent landscape analysis for cell-based meat. In this installment, I’ll discuss the massive patent application by Future Meat, an Israeli clean meat startup that received a large investment from Tyson Ventures earlier this year. This patent application provides a tremendous amount of detail on many aspects of Future Meat’s technology. Future Meat has talked publicly about their plan to distribute smaller bioreactors to farmers for cell-based meat production . This is counter to the strategies of most other companies, who aim to use large bioreactors in order to bring down costs with economies of scale. Some of their reasoning for this counter-intuitive strategy is revealed in the patent application. They discuss their closed-loop perfusion bioreactor system, as well as advances they have made on the biology side. Future Meat’s technology is centered around a closed-loop perfusion bioreactor system that allows for media recycling. The system consists of one or more small tissue growth chambers where cells are cultured, a dialyzer that filters out toxic metabolites and replenishes nutrients, and a controller that controls flow of media through the system. The goal of the system is to maximize the efficiency of media usage, since media is the main cost driver for cell-based meat. Figure 1A from the patent application. Schematic illustrating the entire perfusion bioreactor system. The central component of this system is the collection of small tissue culture chambers. Future Meat specifies that these chambers should be small—around 5L. This allows them to keep capital costs down. In order to scale the system, they increase the number of chambers in the system instead of increasing the chamber size. The dialyzer, controller, and other system components can each service multiple tissue culture chambers. They do not specify what sort of bioreactors they prefer–the system is compatible with hollow fiber reactors, packed bed reactors, suspension reactors, etc. The key to media recycling is the two fluid circuits that bring media to and from the tissue culture chamber. As media moves through the system, toxic metabolites like ammonia are removed, and crucial media components are replenished. The first circuit contains a membrane oxygenator that replenishes O2, CO2, and N2, a heat exchanger that controls the heat of the system, and a bubble trap that removes gas bubbles. The second circuit contains a dialyzer that removes toxins likes ammonia, and adds important nutrients like amino acids, and large growth factors like insulin. Importantly, the dialyzer keeps albumin in the system, since albumin acts as a carrier for nutrients, fatty acids, and growth factors that might otherwise be filtered out. Finally, there is a controller that coordinates the flow of media through the system, and the behavior of components like the dialyzer. As the culture progresses, sensors continually monitor important metrics like pH, temperature, glucose levels, and protein levels, and feed this data to the controller. In a typical culturing process, the culture starts with small amount of cells suspended in a hydrogel. As the cell mass grows, the controller speeds up perfusion of the media through the system, to keep up with the increased nutrient usage. Eventually, the hydrogel degrades and is replaced by native extracellular matrix. Future Meat’s system has a number of potential benefits over traditional bioreactor systems. By using a perfusion bioreactor, they are able to use cheaper media, which they claim is $5 per liter. Additionally, perfusion bioreactors have far higher cell concentrations than batch and fed-batch strategies, allowing for smaller machines which cost less. This effect is magnified by Future Meat’s strategy of scaling with multiple small machines instead of one large one. Additionally, Future Meat’s bioreactors are small enough that they don’t need a seed train , eliminating further complexity and cost. A major problem with perfusion systems is that they generally use a lot of media, which may be addressed with Future Meat’s media recycling system. Table 3 from the patent application. Comparison of Future Meat’s system with a large fed batch system, and a large perfusion system without media recycling. I added the orange rows at the bottom. The final row shows that Future Meat’s system requires less media. At the end of the patent application, Future Meat provides a cost model comparing their system to a large fed batch system, and a large perfusion system without media recycling. In total, they estimate spending $4 per kilogram of meat on media and $1 per kilogram of meat on capital. Together, this is $5 per kilogram of meat, or around $2.27 per pound–an impressively low number. It’s unclear how much work remains to bring costs down to this level. However, if Future Meat is correct about the benefits of using a small perfusion system with media recycling, then their unconventional strategy might pay off. Future Meat’s patent application also goes into significant detail about the types of cells they use in their system, and how they developed these cells. I won’t cover every experiment and technology they disclose in the application, but the Experiments section at the end of the application summarizes most of their technology. Most of Future Meat’s work is done with a spontaneously immortalized chicken fibroblast line . Spontaneous immortalization is the process of serially passaging cells until a cell naturally develops mutations which make it continuous. The benefit of this method is that the mutations are naturally occurring, meaning it doesn’t yield GMO meat. Fibroblasts have serum-free media formulations that are up to 50% cheaper than other pluripotent stem cells, and they have a faster doubling time. The fibroblasts that Future Meats immortalizes are isolated from fertilized chicken eggs. Future Meat cultures a mass of cell isolated from an embryo, and simply lets the fibroblasts outgrow the rest of the culture. One of the main ways that Future Meat brings down media costs is by finding small molecule replacements for expensive growth factors. The main function of growth factors is to bind to receptors on the surface of the cell to trigger the cell to behave in certain ways. If a small molecule has the right shape to allow it to bind to the same receptors, it can trigger the desired cell behavior itself. Small molecules tend to be much cheaper than large growth factor proteins, in addition to being more stable, and having less batch-to-batch variability. In order to identify small molecules that trigger fibroblast differentiation, Future Meat uses a technique pioneered at the Broad Institute of MIT and Harvard . They transduce the cells with a reporter gene (e.g. green fluorescent protein) that is only expressed when the cell differentiates into the desired type. They then use a cellular microarray to test the effects of a large library of small molecule candidates. Each spot in the array contains a small number of cells, and is exposed to one candidate small molecule. The reporter protein then indicates which small molecules caused the cells to differentiate. 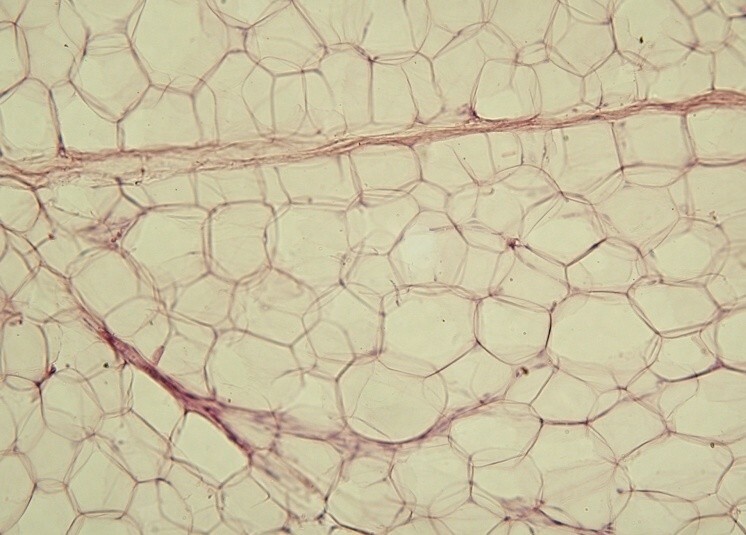 Future Meat attempts this technique for both adipogenesis and myogenesis of fibroblasts. While it seems like they have so far been unsuccessful at finding a cocktail of small molecules that efficiently induces myogenesis, they have been successful with adipogenesis. Professor Yaakov Nahmias, a founder of Future Meat and author of this patent application, said “We can produce animal fat en masse; we’ve patented it, and we think it is going to be one of the major breakthroughs.”  This is likely referring to the success they had identifying small molecules that can trigger adipogenesis for their immortalized chicken fibroblast line. Cultured adipocytes under a microscope. The cocktail of molecules they identify is oleic acid combined with a peroxisome proliferator-activated receptor gamma (PPAR-γ) agonist like rosiglitazone or IBMX. Each of these components had previously been shown to influence important adiopenic pathways, but the novelty here was finding a combination of two molecules that worked with fibroblasts grown in serum-free media. The patent application discusses the possibility of using cultured fat as a flavor-enhancing ingredient for plant-based meats. Since Future Meat’s technology is further along for fat than for muscle, this could be a good early revenue source for them. To make the ingredient, they combine their cultured fat cells with a plant based protein matrix, e.g. Pea Protein Powder. It’s unclear from the patent application whether they culture the fat cells using the protein matrix as a structure, or whether the matrix is added after culturing in order to provide texture. In another interesting application of their system, Future Meat co-cultures endothelial cells with chicken myocytes using a porous collagen scaffold and serum-free medium. The endothelial cells form a vascularization structure inside the tissue, potentially making it easier to create 3D meat. The patent application reports that they were not able to spontaneously immortalized chicken endothelial cells, but they validated this technique with other mammalian cells, e.g. rat cells. The patent application has many independent claims, some of which are very broad, e.g. creating a myocyte from a spontaneously immortalized fibroblast by upregulating myoD1 or myogenin. If this claim is defensible, it is because Future Meat specifies that they use a spontaneously immortalized fibroblast. Many of the other claims are similar in that they are broad, but specify the use of this particular cell type. The patent application was filed relatively recently, meaning that the claims could change a lot before the application is potentially granted. A cell culture system involving a tissue growth chamber, a dialyzer for media recycling, and a controller, where media is perfused between all of the components. Using oleic acid and a PPAR-γ agonist to turn a spontaneously immortalized fibroblast grown in serum-free media into an adipocyte. Culturing fat on a plant-based protein matrix. Creating a myocyte from a spontaneously immortalized fibroblast by upregulating myoD1 or myogenin. using the presence of the reporter to identify whether at least one of the small molecules induced myogenesis. Creating meat by culturing a spontaneously immortalized fibroblast in serum-free media, then converting the fibroblasts into myoctes and/or adipocytes. The fibroblasts can optionally be co-cultured with endothelial cells. isolating a colony of spontaneously immortalized fibroblasts from the remaining cells. Let me know your thoughts in the comment section, or reach out to me directly at robert.e.yaman@gmail.com. Part 3 will discuss Modern Meadow's bioprinting technology. A seed train is a complex system used to generate enough cells to start culture in a large bioreactor. Cells are cultured in progressively larger flasks and bioreactors until the desired number is reached.